Very cute. I’ve never seen one before. Kind of reminds me of a combination between a jay and cardinal (except not blue or red, lol). It’s a lovely photo. What makes them so cute? The size. The big eye. The cute little tuft. Probably all of it! Adorable! I love it when they pluck a peanut out from the Blue Jays! Very cute little bird indeed with a hair style that David Beckham would be proud of! I agree with you…they are soooo cute! We love having them at our feeder. Hi Bev, really nice shot of cuteness. I love these little guts. So, so cute. What a perfect picture. 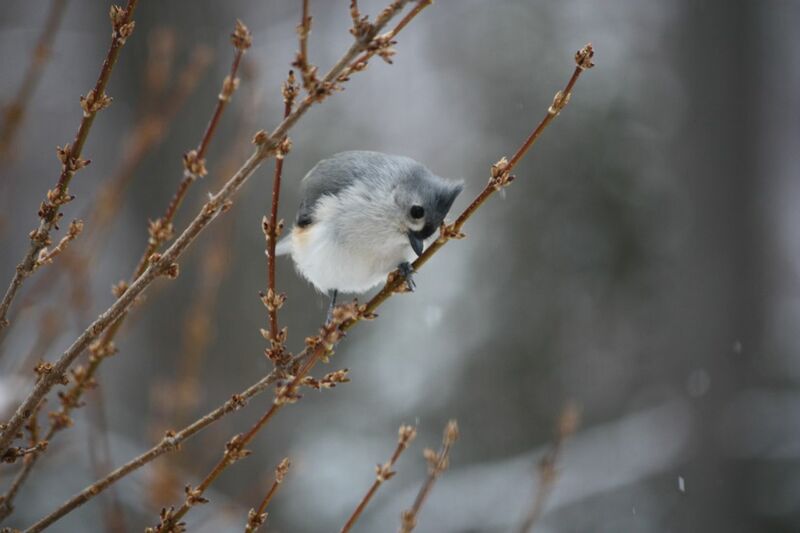 Very cute shot of the Titmouse. Nice pic! I’ve always been a big fan of the Titmouse as they were one of the more common birds in my yard as a child. Too bad the English Sparrows are wreaking havoc on them!